Godsmack is an American heavy metal band from Lawrence, Massachusetts, formed in 1995. The band comprises founder, frontman and songwriter Sully Erna, guitarist Tony Rombola, bassist Robbie Merrill, and drummer Shannon Larkin. Since its formation, Godsmack has released four studio albums, one EP, four DVDs, and one greatest hits collection. 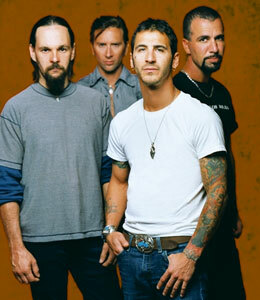 Godsmack have sold over 8.6 million records in the United States according to the RIAA, and over 4 million worldwide with debut album that has sold over four million copies since its release. The band has had two consecutive #1 albums (Faceless and IV) on the Billboard 200, and currently working on their fifth studio album which is expected be released in the first quarter of 2010. The band released their latest single "Whiskey Hangover" in mid-June which reached #1 on the Billboard Hot Mainstream Rock Tracks chart, scoring their 5th #1 single on that chart. The single also reigns as a record-breaking 17th Top 10 single for the Godsmack, extending their ownership of the most Top 10 hits in active rock history. The band also has parked a ratified 14 songs in the Top Five more than bands such as Linkin Park and Metallica. Since its inception, Godsmack has toured on Ozzfest on more than one occasion, and have toured with many other large tours and festivals, including supporting its albums with its own arena tours. The band was also a part Crue Fest 2 which kicked off on July 19 in Camden, New Jersey.